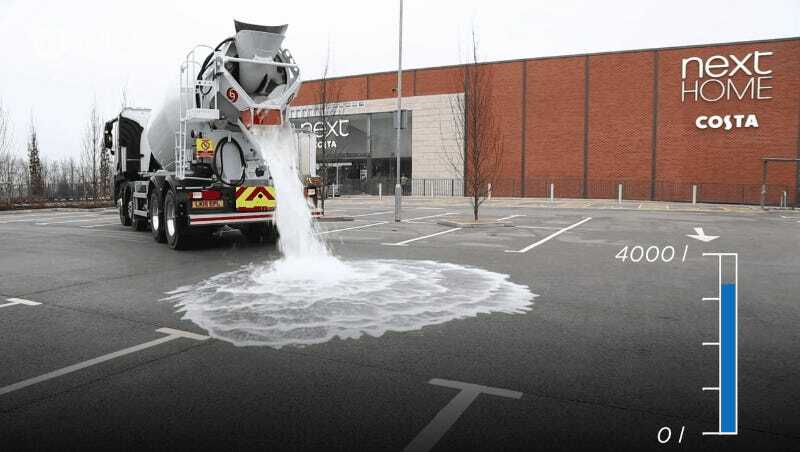 A new kind of concrete from the UK building materials company Tarmac instantly soaks up gallons and gallons of H20–simultaneously preventing flood conditions while also conserving water by cycling it directly back into the ground. It’s called Tarmac Topmix Permeable, and it’s a super-porous concrete pavement designed to remove storm and floodwater from parking lots, driveways, sidewalks, and other surfaces. It was designed by Britain’s LaFarge Tarmac, who call the idea part of a “sustainable urban drainage system.” Water enters the permeable concrete top layer, and then passes through pebbles beneath to become groundwater in the soil. In 60 seconds, it can drain 4,000 liters of water, or just over 1,000 gallons, according to a promotional video from the company. The company says that the concrete could be installed anywhere to mitigate flood risk, but anyone who uses it should carry out a survey first to scope out any sinkholes or other possible pitfalls, literal and figurative, in the area. The one big caveat? If the concrete is installed someplace cold, the water could freeze, which would ruin the whole system. So the company’s next challenge is figuring out a way to build a version of the porous concrete that can adapt to cold climates. Even if it’s relegated to warmer climates for now, a sidewalk that slurps up puddles before soaking our shoes (or worse, our cars or buildings) is a great idea.